I study the abolition of the slave trade with my students using an extended group task based on “The Apprentice” [details here]. Students imagine that “Lord Sugartrader” has invited ambitious young businesspeople to come up with a national campaign to generate support for the anti-slavery cause. Using a range of sources and a structured framework for preparation, groups of students produce a viable campaign which justifies who it is aimed at, where it will be focused and how it will fund itself. A fun plenary exercise (and one of the questions that ‘Lord Sugartrader’ asks each candidate) is to ask each member of the team: “If the group was likened to a human body, with each member of the group representing one part of that body, which part of the body were you? Be prepared to explain your choice”. Make it clear immediately that no rude answers are allowed! You might start by listing a few obvious body parts on the board (e.g. heart, eyes, hands, nose, ears, muscles) and asking students what qualities we associate with each one. Then, give each student a few seconds to reflect on this question individually and in silence. Next, give each team a few minutes to discuss their ideas among themselves, with the stipulation that each member of the team must represent a different body part. Finally, each student in each team should share with the class their answer to the key question and explain their answer meaningfully. 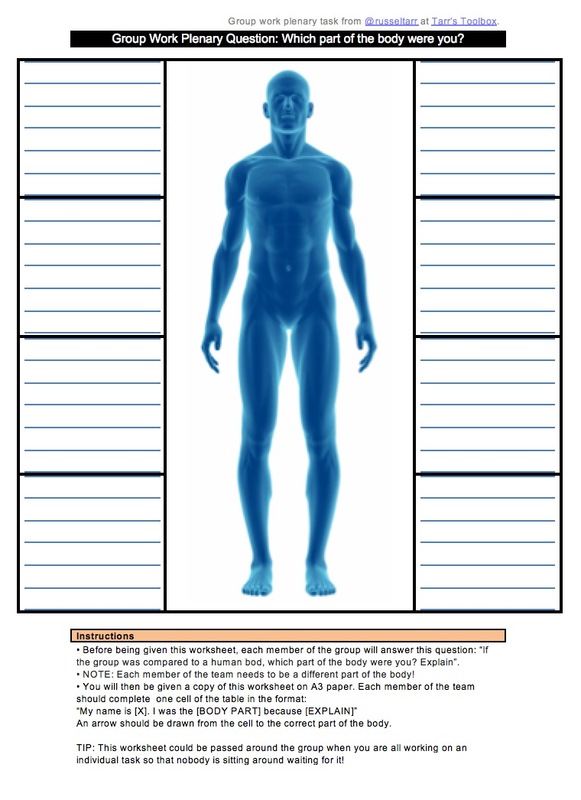 Each team could be given this worksheet (Group Work Plenary Task: Which Part of the Body were you?) and each student should write a sentence on it explaining their choice and drawing an arrow to the appropriate place on the diagram. Give students advance warning of this activity so they can ask their biology teacher about the function of less obvious parts of the human body (e.g. pancreas, liver…). Group Work Plenary Worksheet: Which Part of the Body were you?